Bursting at the seams with some of the richest threads of old America, from street blues, to country swing, to viper jazz, Bumper Jacksons headline RLC Bluegrass Thursday! Doors at 6pm for our weekly bluegrass jam; show starts at 8pm. Bumper Jacksons are a big, fat party. Hot and sweet, their early jazz and country repertoire paints America's story from New Orleans' brothels to Appalachian hollers. Unafraid to scrap together new sounds from forgotten 78's, the Bumper Jacksons boldly and elegantly balance paying homage to the traditions while fashioning their own unique, DIY style. 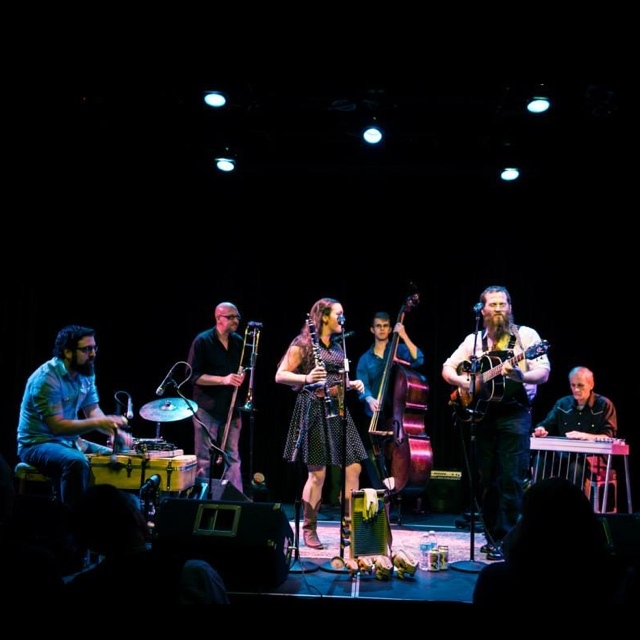 Recognized as DC’s “Best Traditional Folk Band” at the Washington Area Music Awards this past year, the Bumper Jacksons are ready to pounce onto the national scene. Despite their young career, Bumper Jacksons have positioned themselves squarely at the helm of the young roots music scene in DC, pioneering a new, fresh take on American music, and all the while throwing one hell of a party. After immersing herself traditional jazz in the streets and small clubs of New Orleans, front-woman Jess Eliot Myhre (clarinet, vocals, washboard) teamed up in 2012 with her co-bandleader Chris Ousley (guitar, vocals) to form Bumper Jacksons as a duo. Chris, an old time banjo player just beginning to delve into swing guitar, brought the Appalachian influences that are so important to their sound. With the knowledge that the early jazz Jess focused was the music of rowdy urban streets and brothels, and Chris’s old time was also primarily a dance music, although a rural one - the two sought to capture and make cohesive these old sounds of a raucous America. In the spirit of raw adventure, together they explored the intersections between these early American musics in bars, house concerts, and at swing and contra dances. They built a bedrock of repertoire, and the two also developed a narrative and approach to their music as a community-driven art. After two short years, the Bumper Jacksons swelled to become a six-piece band. The talented team of gents (Alex Lacquement (bass), Brian Priebe (trombone), Dave Hadley (pedal steel and dobro), Dan Cohan (The Suitcase) all come from a range of musical backgrounds – ranging from classical, to polka, to rock, to bop – but carry a common, deeply rooted love of early jazz, swing, blues, and old time country. Together, they re-imagine roots music with power and tenderness, and have developed a rich and innovative early American sound. Bursting at the seams with some of the richest threads of old America, from street blues, to country swing, to viper jazz, the Bumper Jacksons bring you into the center of a party where everyone is invited and the dance floor never sleeps.